Life jackets are essential because they are designed to keep you from drowning in the water. That may seem to be obvious, but we’ve all heard stories of senseless tragedies. Some people think that since they’re in a boat, they don’t need a life jacket. However, this is not the case at all. Life jackets should be worn at all times while on a boat. Even in a small shallow pond that is only four foot deep, bad things can happen. You and your friends decide to take a fishing trip on your brand new fishing boat. As your friend reels in the fish that they’ve caught, you notice that they’re leaning over the boat as it is moving. Suddenly, your friend goes overboard WITHOUT a life jacket on. 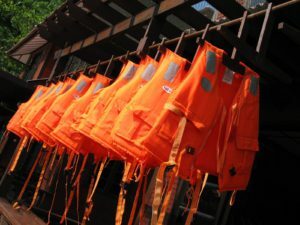 Every year, hundreds upon hundreds are saved by life jackets. Whether it be from drowning, hypothermia, cardiac arrest or trauma, life jackets are generally the #1 reason for the many survivals. What many people don’t know is, life jackets are customized to help keep our body temperatures warm while we’re out on the water. It doesn’t matter how cold it is outside, if you’re wearing a life jacket, it will act as an extra layering for you. If you happen to fall into the water with a life jacket on, please do not panic. Life jackets are made to turn your body around the right way and in the right direction. As you can see, life jackets are beneficial to the boating community. Although they can be bothersome, it’s better to be safe than sorry. Looking for boat buyers in Florida to take your fishing boat? We’ll take it off of your hands! Contact us today for more information.